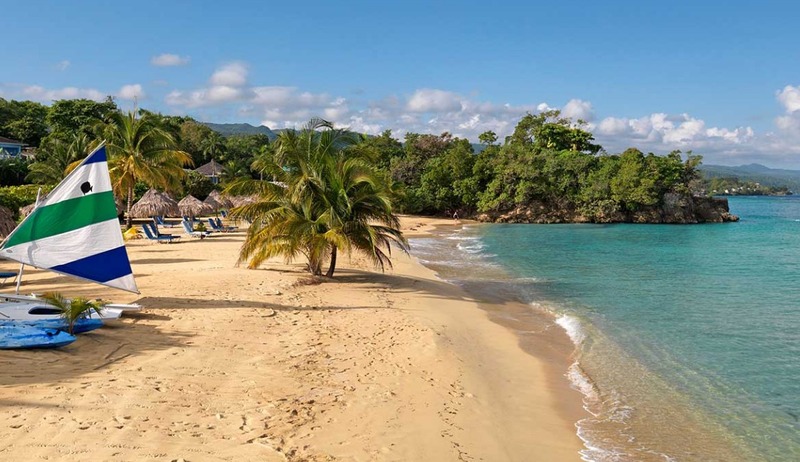 Jamaica Inn is located on a private cove, perfect for swimming and snorkeling. Jamaica Inn is an adults-only boutique resort located on a large white sand beach in Ocho Rios, Jamaica. The resort is located on a private cove with an offshore reef which makes the water perfect for swimming, snorkeling and other water sports. Family owned since 1950, the property has hosted a number of famous guests, including Marilyn Monroe, Ian Fleming and Kathryn Hepburn. Jamaica Inn has 48 rooms, including suites and one- and two-bedroom cottages. All suites have balconies or patios and recently renovated bathrooms. The cottages are set on a bluff and feature private plunge pools and secluded outdoor showers. There’s a restaurant with indoor and outdoor seating, a main bar, a beach bar, pool and beachside wait service, and room service. Complimentary beach activities include kayaking, sunfish sailing, snorkeling and paddle boarding. There’s a spa onsite, set on a bluff overlooking the sea. Jamaica Inn has an optional all-inclusive plan that includes breakfast, lunch, dinner, beverages by the glass and two dinners out at select restaurants in Ocho Rios. Jamaica Inn is located an hour and 40 minutes from Sangster International Airport (MBJ) in Montego Bay, Jamaica. For more information, visit Jamaica Inn’s website.